Finally! A recipe for the perfect pancake (or at least, my idea of perfection) that I can make at home! These seriously might be the best pancakes I've ever eaten, almost the exact replica of the types served at diners. I like my pancakes a bit on the thin side (better for multiple stacking), and these are the perfect size, thin enough to spread out into the pan and really turn into a flapjack. I also like my pancakes just a tad on the "burnt" side. These will cook up quickly because they're so thin, and that delicious "done" flavor will be achieved in under 5 minutes. 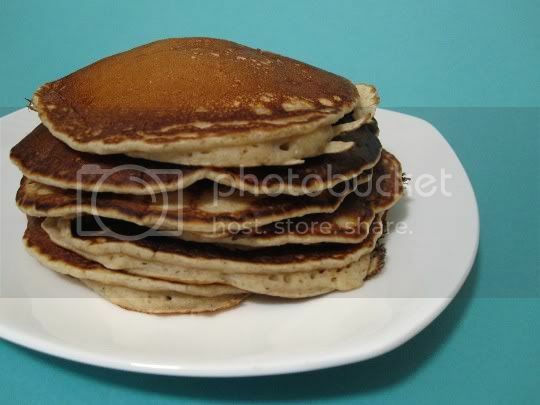 These pancakes are light, airy, soft, and perfectly sweetened (I liked that brown sugar was used instead of white)...in fact, I even ate these plain and was happy without any toppings. So just imagine them with melted butter and dripping with maple syrup...OMG! I didn't really taste the "whole wheat" (a combination of white and whole wheat flour is used), but for all I know, maybe that's the restaurant secret! There was a bit of a hearty flavor, but it's easy to miss because of the light texture. These pancakes will definitely be a go-to recipe from here on out; it would even be worth it to keep whole wheat flour on hand instead of stocking up on the boxed mix! Make again? Absolutely. I can't wait to serve these to friends and family!